NEW YORK—The musical “Hamilton” is taking the subway uptown. 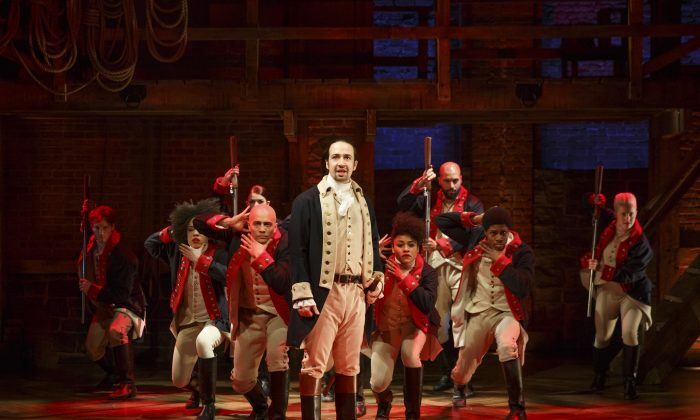 Creators of the hip-hop-based musical on Alexander Hamilton, the first treasury secretary of the United States, said Tuesday they will move the downtown hit from the Public Theater to Broadway’s Richard Rodgers Theatre starting July 13. Opening night is Aug. 6. Tickets go on sale March 8. The show is a retelling of the 18th-century story of America’s birth by a nontraditional cast using rap and song. It stresses the orphan, immigrant roots of “the $10 Founding Father without a father,” his vices and ambition, and his almost Greek tragedy of a death. It’s narrated by Aaron Burr, the man who would kill Hamilton. The new musical reunites the team from “In the Heights” — Kail, choreographer Andy Blankenbuehler and Miranda. Reviews were strong when it opened Feb. 17, and the Public has extended the show through May 3. Kail opened the door to the possibility of changes for Broadway, and there will be at least one cast change when Brian d’Arcy James, who plays a foppish and peevish King George, jumps to another musical by next month.